Diabetes is a condition that may lead to blindness, amputation, kidney failure, and death if not treated properly. Gibbs Pharmacy is dedicated to providing tools that may prevent complications resulting from diabetes. Our pharmacy carries a wide selection of meters and supplies that fit each diabetic patient's needs. Our staff, including Sara Perry and Cindy Pedigo have specialized training in caring for the specific needs of diabetics and can provide meter training if needed. Sara Perry and Cindy Pedigo are available by appointment to counsel patients on meter training and use. 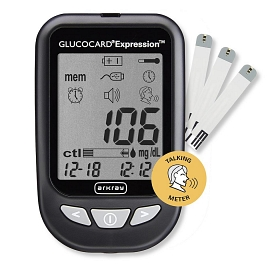 We currently provide the Glucocard Expression meter for our Medicare patients that come to them at no charge. They teach each patient how to properly use this meter. The meter is very user friendly. The meter will say the blood glucose reading out loud, which is great for those that are visually impaired. The meter keeps the patients blood glucose log, but can also be imported and sent to the physicians office. This is a seamless way to assure that the physician is on the same page as the pharmacy and the patient. Patients can call our store 615-449-3355 and ask for Sara to schedule a one-on-one meeting. Cindy has been trained in the fitting of diabetic shoes. She may assist each patient in selecting a pair of shoes from many styles and colors. Remember, Medicare pays for one pair of specially designed shoes with a diagnosis of diabetes. Gibbs Pharmacy offers complimentary glucose testing via glucose monitors to interested parties. Hemoglobin A1C tests are also available. This valuable tool measures glucose levels over a period of 3 months. Fasting is not required. This test is not covered on insurance in the pharmacy. The charge is $30.00. Sara Perry, Diabetes Paraprofessional, and Kimberly Maxey, PharmD offer specialized diabetes education courses called "The Sweet Spot". Each class meeting will focus on a specific topic, such as Diet, Exercise, Meal Planning, and Costs of Diabetes. We hold these classes at the "Gibbs Education Center" located at 1409 A West Baddour Parkway.